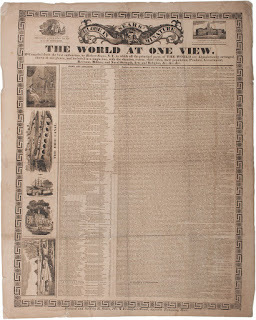 In September of 2017, Cowan's Auctions offered a broadside titled "Sears' Globe in Minature [sic], or the World at One View." 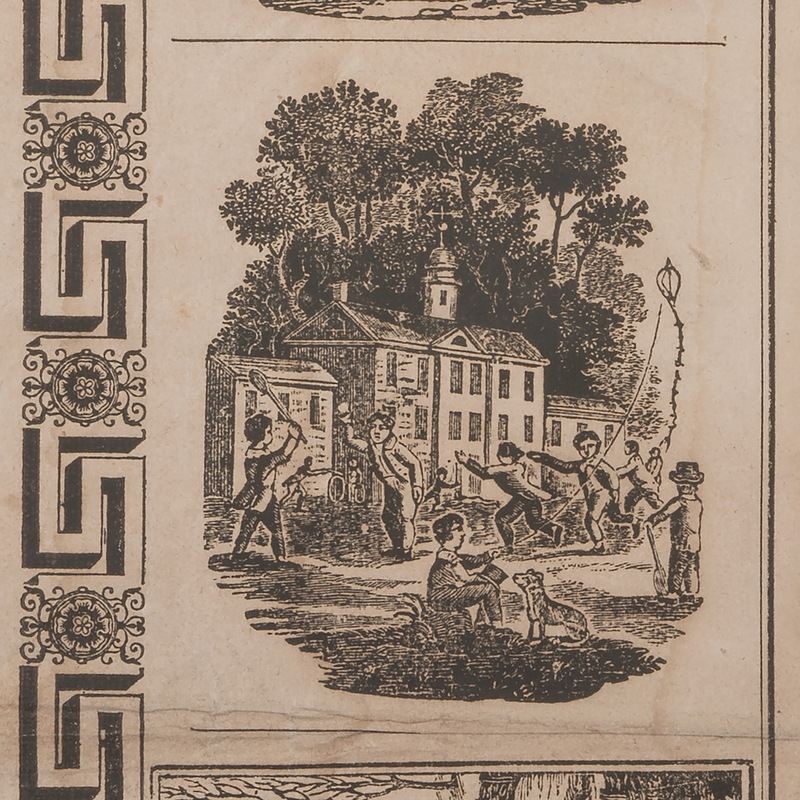 The auction house's description of the lot reads: "Beautiful engravings outline the page including one of boys in an open street playing a game of baseball. Perhaps the earliest image of baseball outside of the chapbook." The World at One View. — The grand climax of human knowledge seems to be then at length reached We have it here in the shape of a mammoth sheet comprising a deal of geographical information compiled from the latest authorities by Robert Sears, of this city. It presents indubitable claims to be pasted on stiff paper, and hung up in counting-rooms and offices. 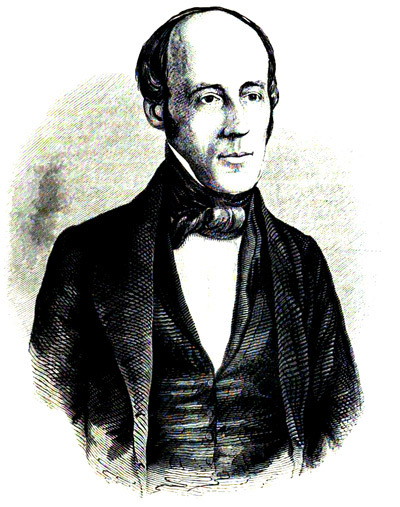 Born in St. Johns, New Brunswick, on the 28th of June, 1810, [Robert Sears] had struggled up, through the laborious scenes of seven years' apprenticeship, and, with a mind strengthened by a solid English education, always kept in view the great end of his life. That hope, to convert the gloomy press into an engine of immense good, to make it a messenger of knowledge to many hundred thousand homes, and have the children of a future age say of him, this was not the Hero of the Sword, but the Apostle of the Printing Press. How did he accomplish it? In the spring of the year 1832, he started in business, and supported his family by printing cards and circulars. The cholera came, and with it the universal panic and the tottering of all public confidence. He was forced to close his shop, and take to his journeyman life again. Still in this time of unobtrusive toil, a great vision of usefulness opened upon him. While working at the press and case, he determined to become a publisher. Without capital, without the praise of pompous reviewers, without friends—save the generous few attracted by his unyielding virtues—he made up his mind to be the publisher of useful books. He calmly laid his plan, and in the silence of the night after the day's work was over, matured it into shape. He determined to pursue the only legitimate method of publication—to advertise his works, place them thoroughly before the people, and leave the people alone to decide on their merits. The cholera passed, and he resorted to his press and types once more. 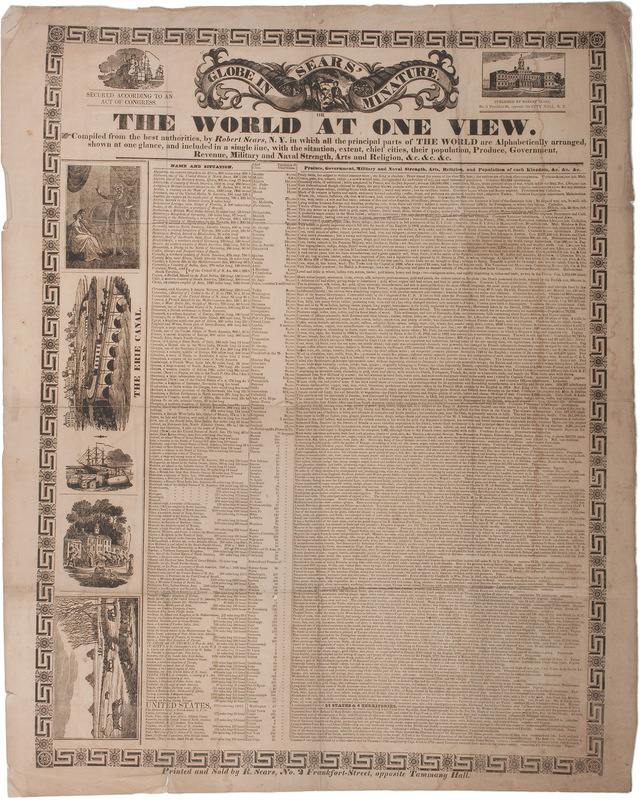 In the short intervals snatched from severe labor, he compiled a chart, entitled, "The world at one view," placed it in type, published it in one broad sheet, advertised it for twelve and a half cents, and was rewarded by a sale of about 20,000 copies. 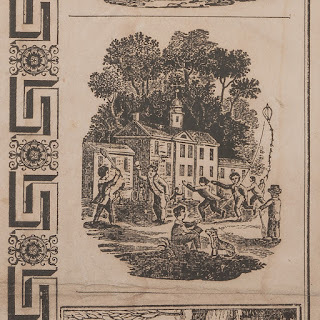 As for the drawing described by Cowan's Auction as "perhaps the earliest image of baseball outside of the chapbook," while it appears that some boys are playing a game involving a bat and ball, it is most certainly not baseball. First, there appear to be two boys with bats involved in the game (one seen at far left, the other at far right); baseball has always featured just one batter at a time. 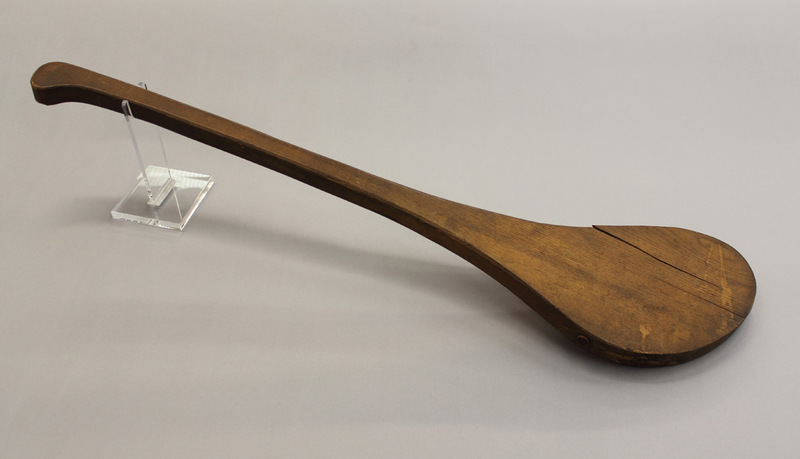 Second, the bats appear to have a circular, flattened end; baseball bats have never looked like this. You can learn more about this mostly-forgotten game of wicket in an article at the Litchfield Historical Society Web site and at John Thorn's Our Game blog. But while the bat may resemble that used in wicket, there is one significant problem: the engraving in question does not show any wickets. Did the artist simply choose not to show the wickets? Or are the boys playing a wicketless variant of the game? Or is it a different game altogether? I encourage historians of early bat and ball games to pass along their thoughts.